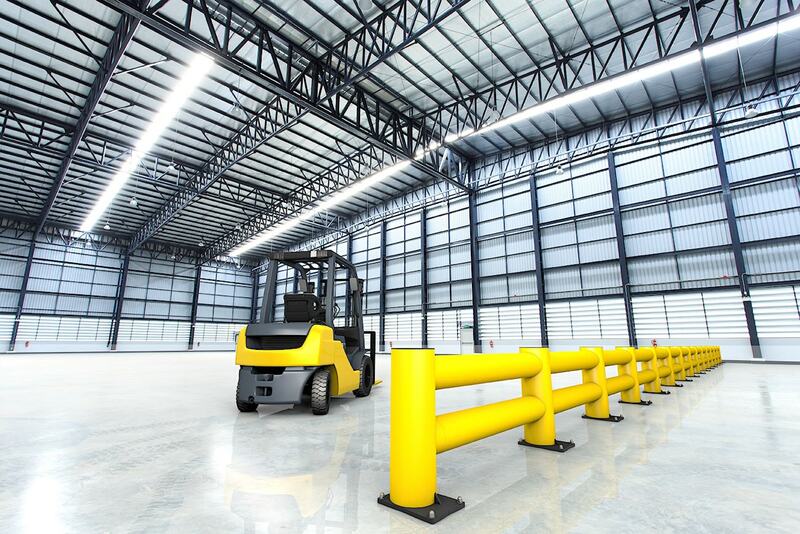 A large number of workplace accidents are caused by collisions between pedestrians and forklifts. Half of all victims of these types of collisions are pedestrians who perished from the crushing impact of a forklift that was barely moving! The weight per wheel of a forklift is considerable when compared to that of a regular passenger vehicle. Even at limited speeds, a forklift remains a huge risk for pedestrian safety in the workspace. Do not wait for a deadly forklift accident to happen in your company. Prevent workplace accidents by reliably securing your workplace. FLEX IMPACT® offers a complete range of safety solutions that can be modularly combined to support your company’s needs. This shows that pedestrians and forklifts need to be separated as much as possible. And the best way to do that is by forcibly and clearly demarcating pedestrian zones by placing clearly visible barriers. This investment will not only save you money over time, but also prevents a great deal of suffering. As ultimate proof of the extreme impact resistance of our safety products, each and every one of them is subjected to a series of strict, extensive and very realistic crash tests. Specialised staff execute various static and dynamic tests. The actual proof comes from outdoor tests. 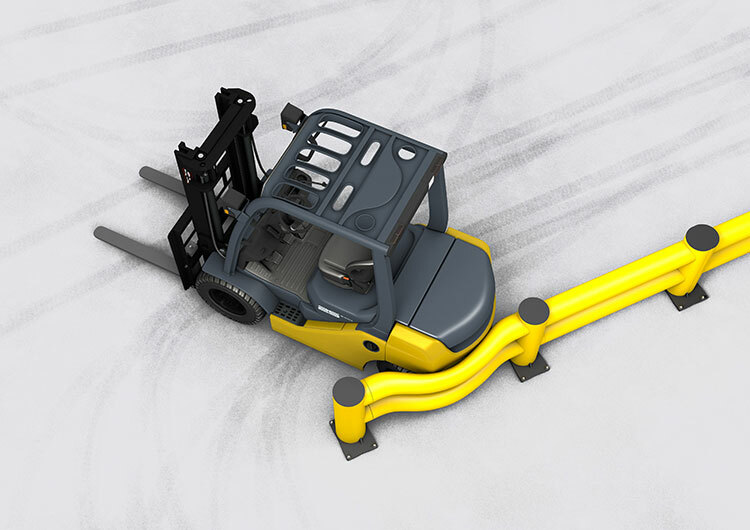 On a racetrack, forklift weighing 3.5 tons will collide into our barriers from various angles and at increasing speeds. High-speed cameras will register the various speeds, angles of impact, deformations and the exact point of impact. The crash protection not only survived the collision under all conditions, but the forklift retained its safe position after the impact. These extensive crash tests enable us to launch safety products on the market that comply with the highest standards of safety. These crash tests have enabled us to develop special software that lets us use collision simulation to predict the behavior, burden, impact, deflection, tension and a series of other parameters for each of our products. In order to integrate all of that acquired knowledge into our products, we work in close collaboration with distinguished research firms and university research centres. Based on our knowhow, we were called in as consultants to help determine the safety standards in our industry. A clear and highly visible physical demarcation is the most efficient way to separate your traffic zones from the pedestrian zones in the workspace. 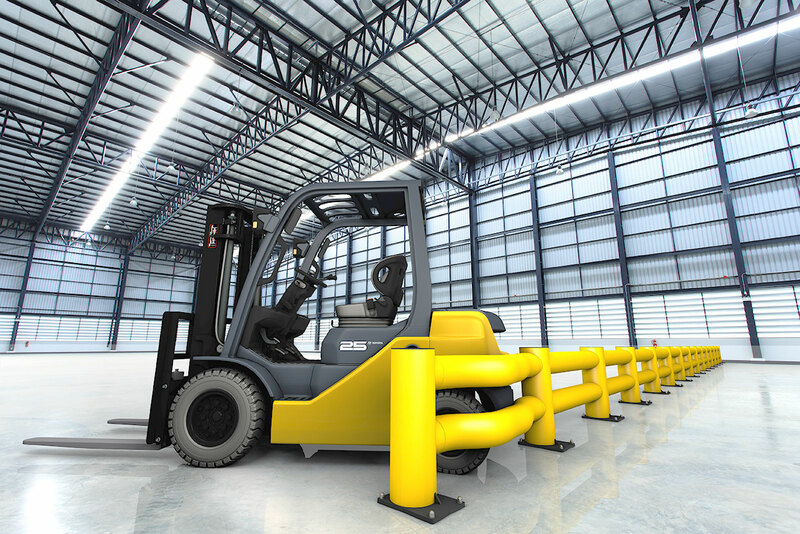 Forklifts, Clark lifters and pallet trucks are among the most dangerous types of rolling stock in the workspace. Almost half of all victims in collisions involving such machines are pedestrians. Our FLEX IMPACT® barriers offer a simple safety precaution to separate your pedestrian zones from busy forklift traffic zones. 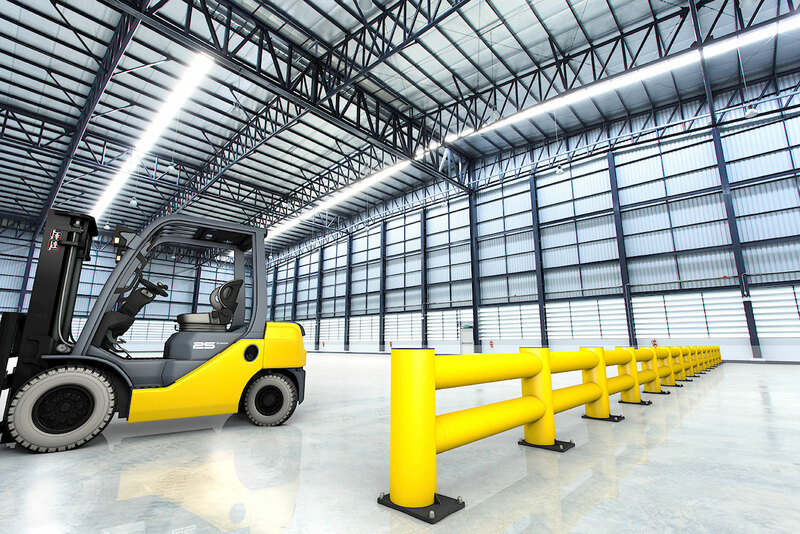 Clearly visible FLEX IMPACT® barriers need to be installed in strategic places, at locations where forklift traffic is prohibited. These include the zones around your company restaurant, in the vicinity of your reflector, the location where you have your timekeeping administration, at the entrances, near your sanitary facilities, etc. 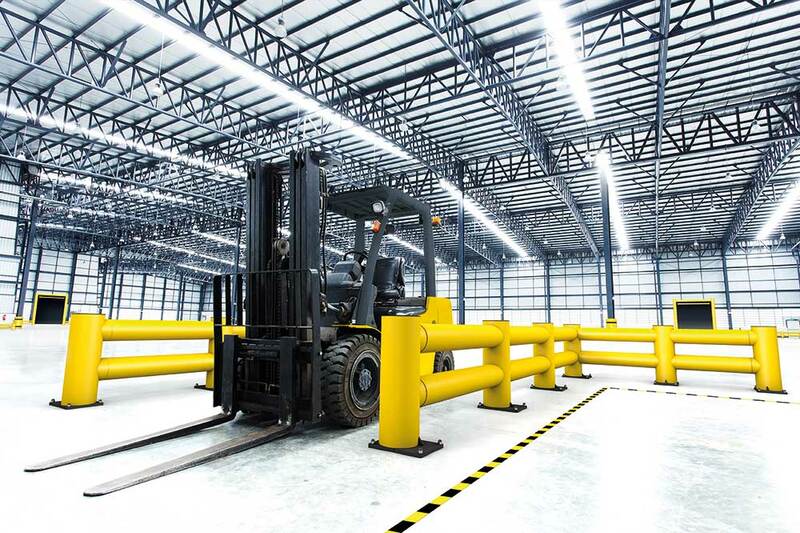 Less logical locations would be the zones within your warehouse or outside on the company grounds, where you will have pedestrian traffic circulating alongside forklifts, vans and lorries. In these situations, it is also imperative to ensure the maximum safety of your pedestrian staff by placing clearly visible safety fences, safety posts, handrails and security gates. Indicating exclusive zones for pedestrians is best enforced within a radius of 3 meters, separated from any kind of traffic involving rolling stock such as forklifts. The best way to demarcate pedestrian zones in the workspace is by placing physical barriers. FLEX IMPACT® consists of a series of systems to provide crash and impact protection, manufactured from flexible polymer with high-tech, highly impact-resistant properties, even at high collision speeds. The thick-walled, fortified polymer elements bend with each impact and reform to their original shape again afterwards. In addition to these superior impact-resistant properties, our polymer impact protection systems also have other advantages which will make it inevitable for their iron and steel predecessors to be replaced by the synthetic debutants on the market. FLEX IMPACT® is an extensive modular array of safety systems that have been specifically designed to create a safe work environment in an economically responsible way. If you consider security in the workspace a high priority, you will need to do your utmost to ensure optimal protection of personnel, machines, property, buildings and infrastructure. Collisions are one the main risk factors for workplace accidents, causing physical and/or material damages. Halting the machines after temporary failure and recovery causes exponentially increasing, unnecessary costs. Physical injury not only means a considerable delay of work, but often also leads to human suffering. And as a company, that is the last thing we want. FLEX IMPACT® security systems have been specially designed from flexible polymer, which is highly impact-resistant, flexible and shock-absorbent. All of our safety systems have been tested extensively over a long period of time in order to comply with the strictest standards of safety. In any kind of impact due to collision, the material simply bends and then returns to its original shape again afterwards. The unique thing about it is that our safety systems fully retain both their looks as well as their essential properties afterwards. In addition, FLEX IMPACT® uses a modular construction, making it possible to install each and every element separately. If necessary, each element can be replaced separately as well. This approach allows us to offer a durable safety product with a cost-efficient impact that should not be underestimated.